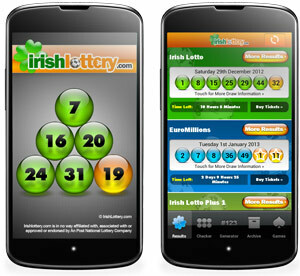 The Irish Lottery Results Android App is now available to download for free, letting you keep up to date with the latest results wherever you are! The App is extremely easy to use, and best of all, it's completely free! View the most recent results and prize breakdowns for Lotto, EuroMillions and Daily Million. Check your numbers against all draws that have taken place in the last 90 days. Random Number Generator - get an automatic 'Quick Pick' set of numbers for your chosen game. View archived results back to the very first draw in 1988. Works on Android version 2.2 ("Froyo") and above. Open your android device Settings and find the Unknown sources option (depending on your device, Settings is found within Applications or Security). If not ticked, tick the checkbox and then tap OK, should there be a confirmation popup screen. From your Android phone or tablet, visit: irishlottery.com/en/play/irishlottery-com-android, scan the Irish Lottery App QR code, or tap the download button above. When the download to your Android device is complete, open your notifications and tap on irish-lottery.apk. You're done! Start enjoying your new App. The complete process only takes moments, so you should be up and running in no time!